Into the food deals with Food and Eating Design, two new disciplines that embrace design studies and research and which give life to new products connected to food and experiment new ways of eating it in particular surroundings and/or circumstances. This new, somewhat unusual, angle take on food offers a surprisingly involving experience. We’re sure food design will open up a new way of relating to food and a new awareness of its relevance. 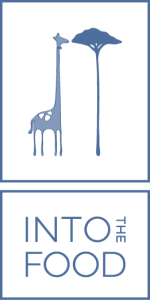 The Logo of Into the Food was created from the idea of relationship between living beings and their own food. The selection of long- necked giraffes occurred because the short-necked had a lot more competition with other herbivorous animals. The long- necked giraffes survived precisely because they could eat undisturbed the towering acacia umbrella, today the basis of their diet. The link between food and living area is very strong and this is very evident in the evolution of the species that we have chosen as a symbol of our work. If “we are what we eat”, famous words of the German philosopher Ludwig Feuerbach, then what better example of the giraffe!